Bet you've never seen Capricorn's symbol before -- it's a sea-goat! Do you know what the Aquarius constellation looks like in the night sky? Complete this dot-to-dot worksheet to find out! This is one angry looking constellation! Meet Taurus, one of the twelve constellations of the zodiac. 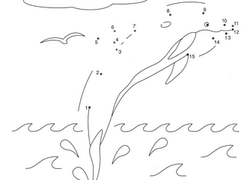 Dive into this astrological dot-to-dot worksheet with Pisces, one of the twelve constellations of the zodiac. Sagittarius clearly isn't your average archer -- for one, he's half a man and half a horse!